Our Fo Cha (Buddhist Tea) comes from Jiu Hua Mountain, one of the four sacred Buddhist mountains in China. This sacred mountain has more than a thousand years of recorded history and about a hundred of temples and monastaries built on the hills around it. The locals believe that drinking this tea can help to calm a person's mind and soul. 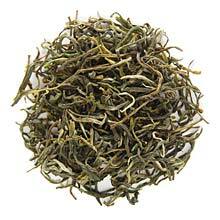 Jiu Hua Fo Cha is simply an excellent tea with pleasant floral aroma and a sweet refreshing aftertaste. Very beautiful fresh green tea leaves. Due to popular demands, we are bringing in a higher quality Buddhist tea this year. Unlike previous seasons, this batch of Jiu Hua Fo Cha tea leaves are untwisted. When infused, the leaves easily sink to the bottom of your cup.